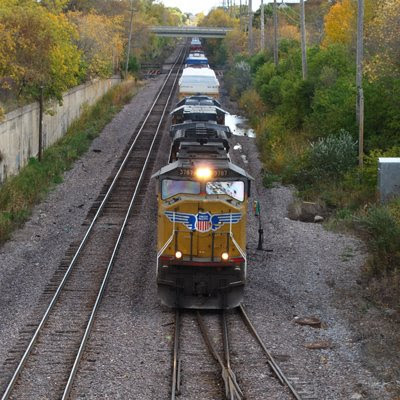 This Union Pacific freight train was headed west on the south side, just east 0f 20th Street, south of Cleveland Avenue. I caught a glimpse of the train as I was driving over the bridge, and realized that I could get a shot if I pulled over and ran to the center of the bridge. After getting a couple pictures, and admiring my luck, I learned a valuable lesson: slow-moving trains with large diesel engines put out a LOT of exhaust. This is a great shot! My son loved it... He loves trains!